A silky, nutty mouthfeel, balancing many layers of rich hazelnut and pistachio and a crisp and pleasant robust finish. 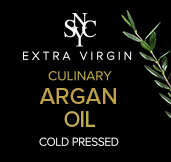 This tasty and healthy vegetable oil is loaded with Unsaturated Fatty Acids (at 82%, the highest percentage of most vegetable oils) with Omega 3+6 (oleic and linoleic acid) and Vitamin E as key components. The good cholesterol and lots of antioxidants help a nutritious lifestyle. The still hand cracked cold-pressed kernels of the Argan nut, artisanal roasted, are actually stone fruits, so nut allergies do not apply.